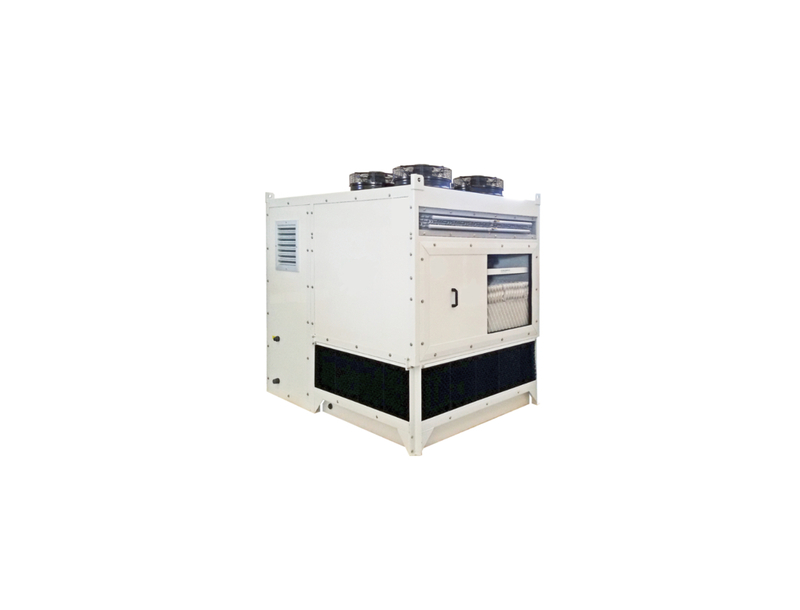 The PAD G-C series (adiabatic gas cooler) is suggested for CO2 refrigeration systems and to obtain greater efficiency compared to the classic air systems. Adiabatic cooling is based on the sensitive exchange between the fluid flowing inside the finned coils and the air that brushes against the surface. In the summer season, the air is humidified before it hits the coil, so as to lower the temperature and increase the efficiency of the system even in the hottest period. PAD G-C is the best solution to obtain high COP and low pressure in the circuit in the presence of high external temperatures. – All models are completely preassembled and equipped with an electrical panel (PLC that allows continuous optimization). – Humidifier pack with high water retention capacity made of flocked PVC (very short wetting cycles). – Double V-finned coil in copper and aluminium with stainless steel collectors. – EC fans for low electrical consumption and noise. – Support carpentry made of press-folded galvanized sheet metal and subsequently protected by an epoxy paint cycle. – Capacity from 75 to 500 kW.